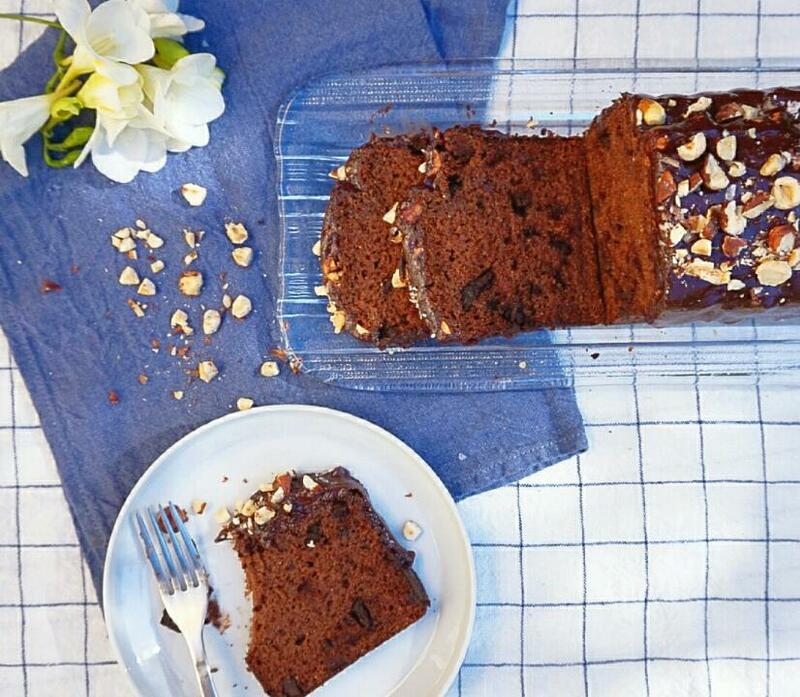 Triple choc banana cake with rye, dates and hazelnuts. This is one of those recipes which have no intention at all. One day I took a recipe from a book, made it, liked it and after two weeks and without any conscious intention, as I said before, I turned it the other way around and made something completely different. Sometimes I wake up dreaming with new changes (yes, yes, I am a bit crazy!). Sometimes I read somewhere something which gives me an idea and everything turns out to be something else again.Or the lack of one ingredient is one of those things which inspire me to come up with something better to improve the final elaboration. But I must say that perhaps it is not so true that there was no intention at all with the changes I decided to make. Yes, it is completely true that in my eagerness to make a healthier patisserie than the one we can find everywhere nowadays, I have pushed the sugar levels to the limit, have tried to use multigrain wholemeal flours and to reduce the amount of animal-origin ingredients…And sometimes, the results were so disastrous! Not so much in a visual level, which was not that good either, but if we refer to the taste profile, the final outcome would make one weep. But that´s when the challenges and a well-understood stubbornness play their part! 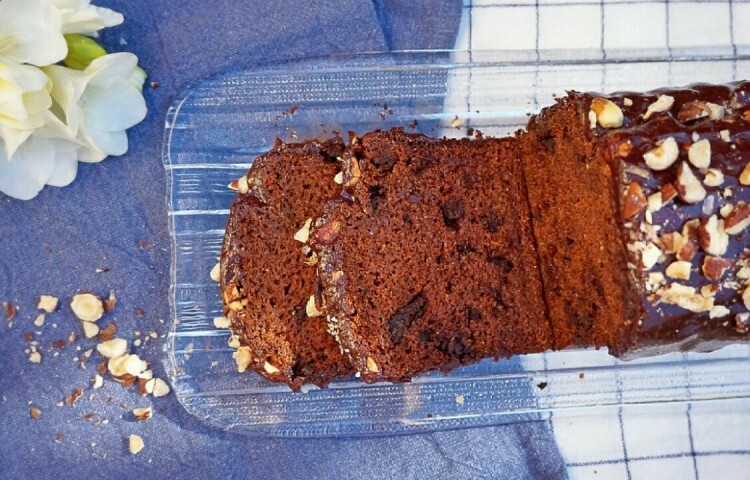 Today´s recipe exemplifies the reward for all my effort (and the excessive feasting of my loved ones tasting so many different sweet samples) I have managed to make a banana cake, refined sugar-free with a little maple syrup as one a substitute,while the other amount was replaced with dates. It has got a super juicy texture despite including wholemeal flours, one of them rye, which is more nutritious and gives a better taste. And I have replaced the original olive oil with coconut oil, which is better for high temperatures and goes really well with bananas! The only thing I haven´t tried yet because I didn´t have at home at that moment (something I hope to make really soon!) is adding a small spoon of rum to the dough. Yes, yes, rum…don´t worry, the alcohol will evaporate by itself, but it will probably give a really good taste. Think about this: coconut, rum, banana and chocolate…! 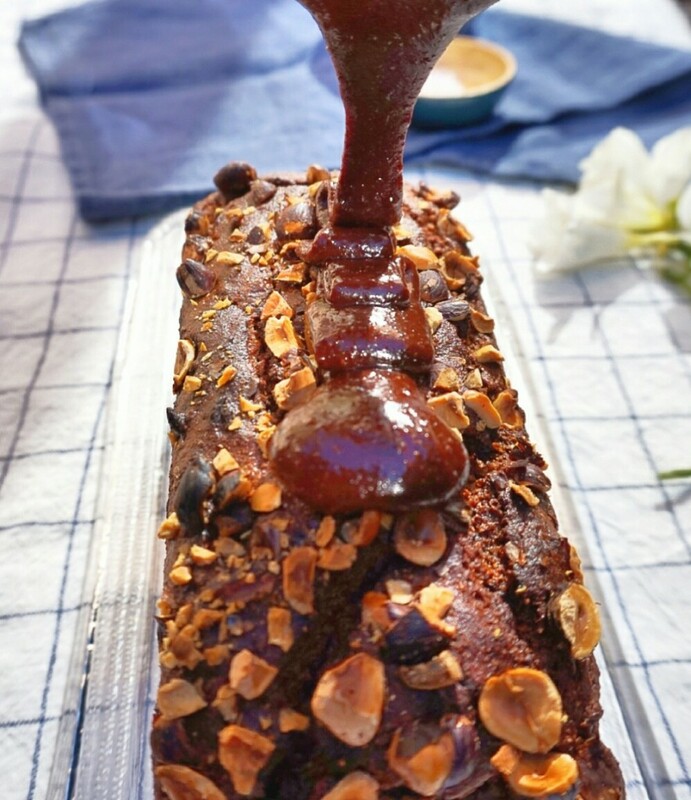 As you already know, a banana cake is the perfect occasion to use all those ripe bananas and so, before freezing them all to make shakes, I would advise you to try this recipe. As it happens with the good stews, have in mind that some sweet elaborations get better the next day. This is one of those ones. p.d: if you want to make your own nut butter click here. If your dates are not soft, let them soak with the water from the recipe for a few hours ( without the stone). Get your mould ready by greasing it or covering it with parchment paper. Turn on the oven at 180ºC. 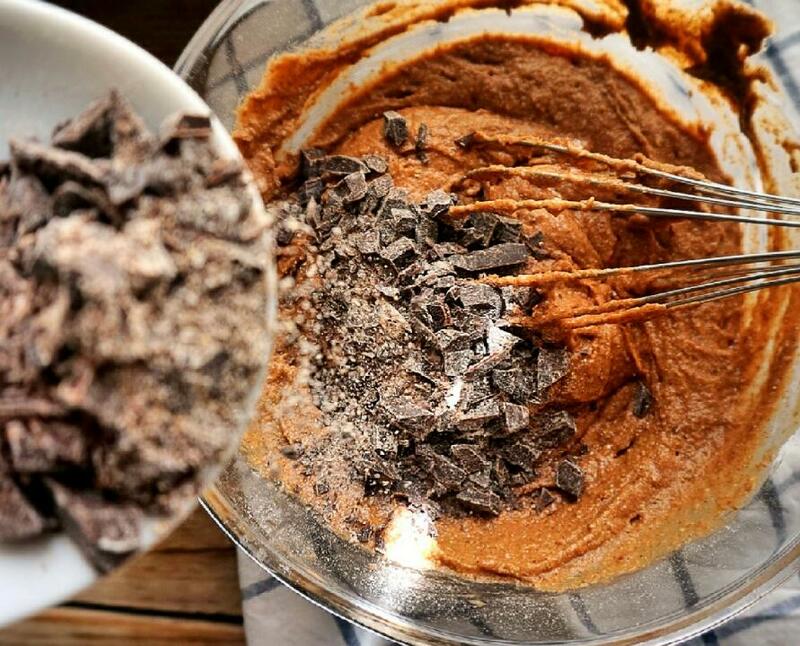 Get all the cake ingredientes together. Melt the coconut oil on a bain marie, or using the heat from the oven only for 5 minutes ( don´t forget it inside!). Chop the hazelnuts and put half of the amount in a small bowl and the other amount in another bowl. 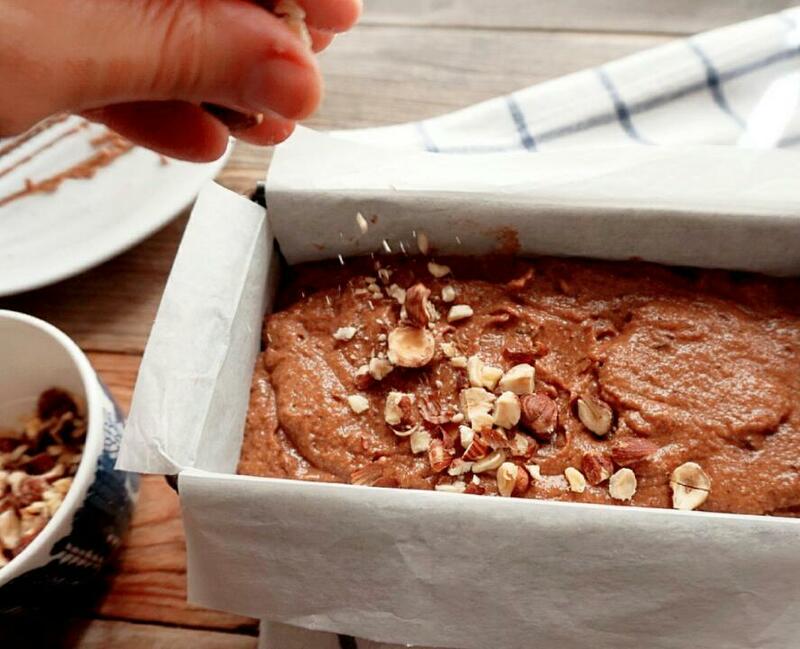 Chop the chocolate and mix in a small bowl with the tbsp of flour. That will help the chocolate from not falling to the bottom of the cake while baking. 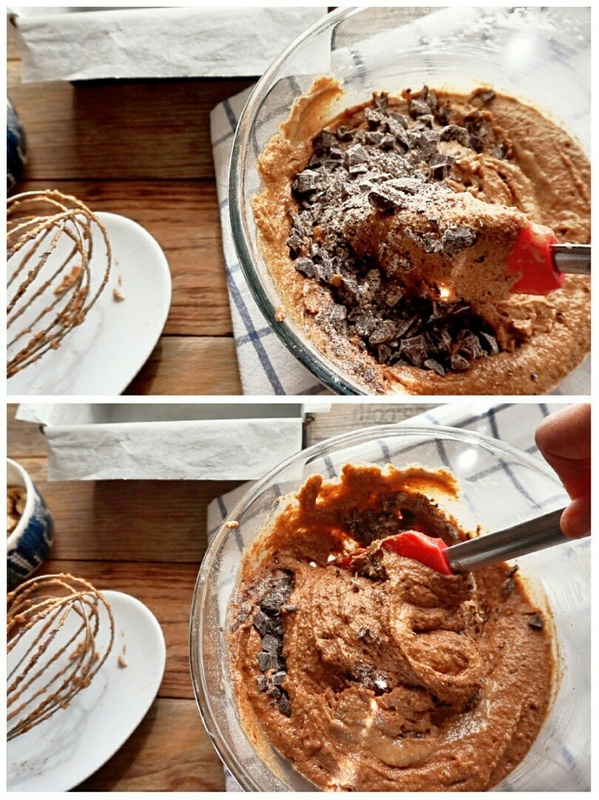 In a big bowl mix the first six ingredients with a whisk. In a food processor blend the rest of the ingredients: water, dates, bananas, nut butter, maple syrup, melted coconut oil, vainilla and apple cider vinegar. 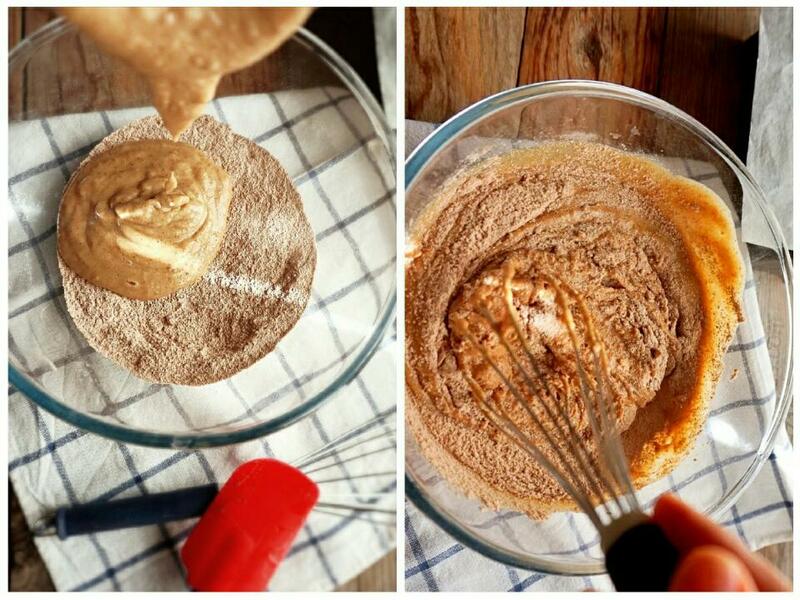 Pour the mixture over the dry ingredients and stir with a whisk. Add the chopped chocolate and mix carefully. 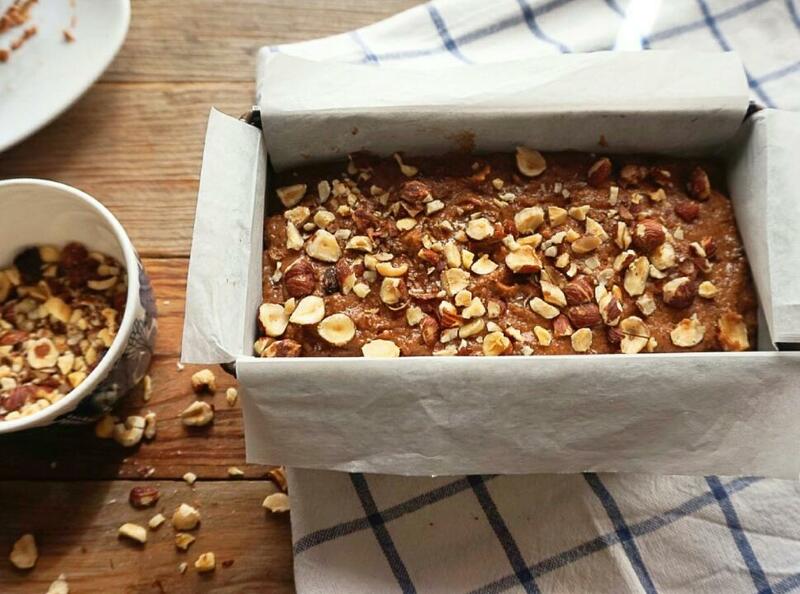 Pour that batter over your mould and sprinkle the chopped hazelnuts from one the reserved bowls. Bake one hour, turning it after 40 minutes. Meanwhile, melt the cacao butter in a bain marie. Add the rest of the ingredients and stir to combine. Turn off the heat. Once the cake is done, let it cool on a wire rack. Once cold, pour the glaze over it , sprinkle with the rest of the chopped hazelnuts and some maldon salt crystals.